Sold by : Sun Hygiene Foods Pvt. Ltd. Nuts like almonds, walnuts, peanuts and more are known for their health benefits. 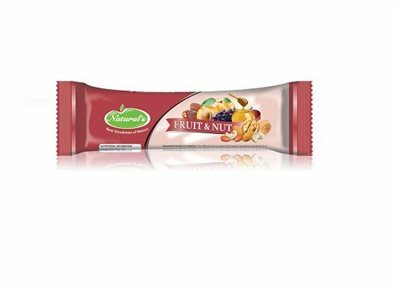 Besides good taste, our fruit and nut bars are highly rich in proteins, minerals, omega fats, and vitamins. The sweetness of honey makes them more yummilicious and healthy. All Ingredients used in energy bars are Natural. Natural’s fruit and nuts bar is delicious, gluten free, wheat and dairy free. Good for Brain, Regulates Cholesterol, Good for Heart. Improve Blood quality, Lower the Risk of Excessive Clotting, Lower Risk of Excessive Inflammation, Anti Cancer Benefits. powerful antioxidant, increase HDL or good cholesterol, provide protection against Alzheimer's disease and age-related cognitive problem. protection against Heart Disease, Cancer and Diabetes, control blood pressure. Antioxidant and anti-bacterial properties, Great natural source of carbohydrates.